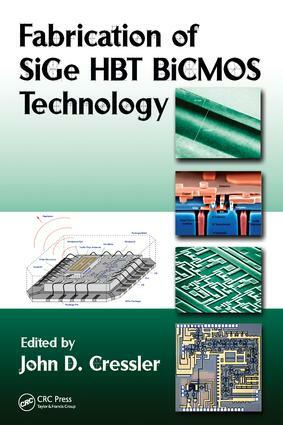 SiGe HBT BiCMOS technology is the obvious groundbreaker of the Si heterostructures application space. To date virtually every major player in the communications electronics market either has SiGe up and running in-house or is using someone else’s SiGe fab as foundry for their designers. Key to this success lies in successful integration of the SiGe HBT and Si CMOS, with no loss of performance from either device. Filled with contributions from leading experts, Fabrication of SiGe HBT BiCMOS Technologies brings together a complete discussion of these topics into a single resource. Drawn from the comprehensive and well-reviewed Silicon Heterostructure Handbook, this volume examines the design, fabrication, and application of silicon heterostructure transistors. A novel aspect of this book the inclusion of numerous snapshot views of the industrial state-of-the-art for SiGe HBT BiCMOS technology. It has been carefully designed to provide a useful basis of comparison for the current status and future course of the global industry. In addition to the copious technical material and the numerous references contained in each chapter, the book includes easy-to-reference appendices on the properties of Si and Ge, the generalized Moll-Ross relations, integral charge-control relations, and sample SiGe HBT compact model parameters.